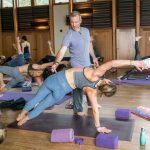 Unplug, unwind and reconnect with your spirit during this special New Year Yoga Retreat. Each morning will begin with quiet meditation followed by a vigorous Vinyasa flow. In the evenings, we will enjoy the support of community as we reflect on the triumphs and challenges of 2019, and set intentions for a harmonious start in 2020. Join Pete and Stephanie at the serene Land of Medicine Buddha and set the foundation to manifest the true desires of your heart, remembering that the profound and unending flow of grace supports all that we set our sights upon. During breaks, explore the breathtaking trails accessible from the lodge’s grounds or the adjacent 10,000 acres of State forest, grab a book, or simply enjoy a catnap in your cozy bedroom. Note: All levels welcome. Please bring a yoga mat, towel, extra magazines and craft supplies (for VISION board if you have them) and – most importantly – an open heart. Space is limited at the Land of Medicine Buddha so please sign up soon! Our retreat begins Sunday, December 29th at 2:00 PM. Our retreat will end on Tuesday January 1st at 11:00 AM after a closing circle. Brunch will be served following the closing circle. If you would like to join the Ano Nuevo State Park Public Seal Walk, there is an option to choose during check out – Limited tickets are available. Nature Tour – 2 hr. 30 min.